When your team is neck deep in work, the last thing on your mind as a small business owner is to encourage everyone to use up their vacation time. Every day looms as another day that you’ll have to find someone else to substitute for them or take on extra work. Take a stand against this trend of all work and little play. 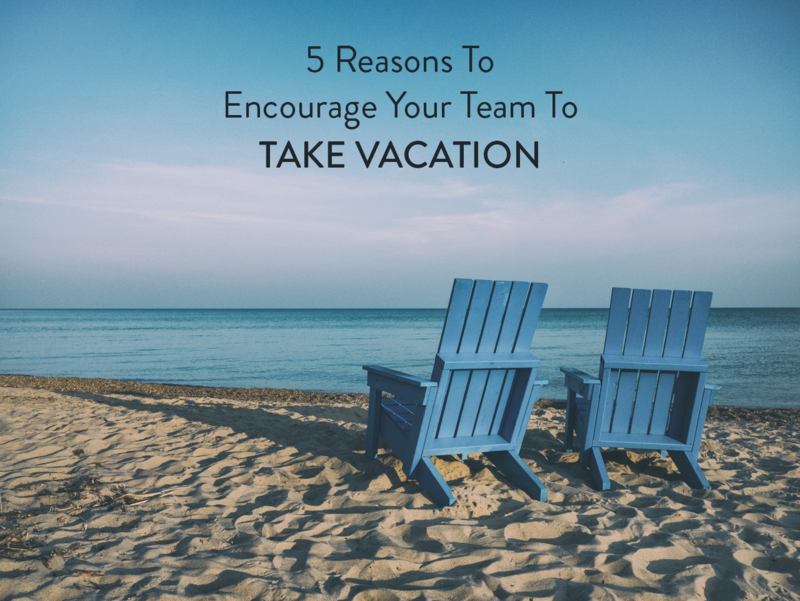 Here are five reasons to encourage your employees to take a vacation. 1. It contributes to a great company culture. When you run a small business, it’s hard to compete with the big guys in winning the war for talent. One way you can gain an edge is by offering a generous vacation policy and making it possible for employees to actually use their paid time off. Even if you can’t afford to give your team a raise to pay for that next getaway, you can put in place a plan for vacation coverage that removes the other barriers. Cross-train your team ahead of time so no one has to leave in fear that they will be buried with work when they return or that an untrained substitute has created a disaster for them to fix on their first day back. There’s nothing wrong with setting a deadline for employees to submit summer vacation requests to ensure that you can meet customer demand in an orderly way while they are away. 2. It keeps your team’s energy level high. No matter how young and energetic your employees, they still need time to reboot. Even if they can’t afford to head off for two weeks in Aruba, taking a break from a familiar work environment for a few days can help employees recharge and ultimately get more done and bring fresh thinking to their projects once they get back. It may even help them reach their career goals more quickly. Project: Time Off’s research, reported in Harvard Business Review, found that workers who took fewer than 10 of their vacation days annually had a 34.6% chance of receiving a raise or bonus in three years. In contrast, those who took more than 10 of their vacation days had a 65.4% chance of receiving a raise or bonus. 3. It will help employees strengthen their relationships. No one can maintain healthy relationships when focused on work 24/7. When employees take time off from work and spend time with their families and friends on a vacation, it allows them to deepen bonds that contribute to their overall happiness and reduce the stress that comes from neglecting loved ones during busy seasons at work. And when they return to work, their positive energy will be contagious. 4. It lowers balance sheet liabilities. In some companies, vacation days expire if unused. But if your company allows employees to roll over paid time off, this liability can build up on your balance sheet. American companies had a collective $272 billion vacation balance sheet liability on their books in 2016—up 21% from 2015, Project: Time Off found. The per-employee liability in 2016 averaged $2,226. 5. It may lower your healthcare costs. Taking vacations may reduce the risk of certain health issues. The Framingham Heart Study, for instance, found that men who didn’t take a vacation for several years were 30% more likely to have heart attacks than men who didn’t take time off. It also revealed that women who vacationed once every six years or less were almost eight times more likely to develop coronary heart disease or have a heart attack than women who took at least two vacations per year. If you don’t want to create an environment that wears down employees’ health, nudging them to take their vacation time can go a long way. It will help your company, too: If employees develop chronic health conditions, it can contribute to higher healthcare costs for your company. Plus, they might have to take a lot more time off to deal with their medical issues than they would on an average vacation. Encouraging employees to vacation might seem impractical at the moment, but remind yourself of the bigger picture. Over time, when you keep employees energized and engaged your business will thrive.